Here's an example of a strip genre that came on like gangbusters in the 1930s, matured by the 50s and was all but gone by the 60s. Many strips and panels that touted the wonders of classified advertising were created, though few did particularly well. I'd say that the most popular was Larry Reynolds' Quickies. Other popular features include Howard Baer's Too Late To Classify and Want-Ad Wonders, yet another Believe It Or Not imitator. Classified Ad-Ventures had a short run (as far as I know) but is distinguished with excellent art by Ben Stahl, much in the Milton Caniff/Noel Sickles chiarascuro style. Unfortunately the nice details on the strip are all but lost in this scan from a microfilm newspaper. I have found runs of the strip from 1937 and 1940. I don't recall any other 'want ad' strips that mined the adventure strip genre. Neat stuff! Very interesting strips, to think that there were so many the never made it for very long. This is the final Winston strip. There's few things I like better than finding a strip that heralds its end date like this. Not only does it put a definite punctuation on the end of the run, but often the final strip reveals something personal and intimate about the cartoonist and their feelings about the event. Some take it sadly, as Jim Burnettte and Johnny Sajem do here, others put on a brave face, still others find it in themselves to laugh about the demise of their brainchild. Allan, I enjoy this blog of yours. It is a wonderful thing you're doing. I really enjoyed this final strip. I liked this and similar gag strips of the era. Alfred Brewerton, if known at all, is known for his soap-opera strip Pam that ran 1928-1943. Those who have seen that strip tend to assume that Brewerton was not a particular competent cartoonist. Not true - the problem was that he was trying to draw the strip in a more realistic style than he was used to. 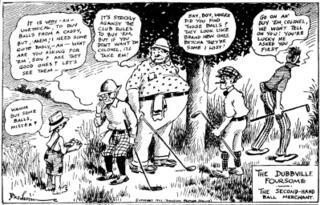 Here is a neat golf strip called The Dubbville Foursome he did as a weekly panel; typically used on Sunday sports pages. The strip ran at least 1922-1927 and started with the Thompson Service. In 1925 it switched over to McNaught Syndicate. I think you'll agree that the art is quite nice. Brewerton's career is a bit of a mystery - he first makes an appearance at the New York World in 1903 doing a few very short-running strips. In the early teens he pops up again and does a minor strip and sports cartooning. Then he disappears once again from my radar until the early 20s. Anyone have biographical information on this fellow? Hi Allan: I stumbled on your wonderful site after doing a stab-in-the-dark Google of Alfred Brewerton. Another site had this biographical info: "Born in Kansas in 1881. Brewerton was a resident of Los Angeles in 1905 and a cartoonist for a newspaper in Atlanta, GA in 1910-20. I remember Brewerton as an editorial cartoonist for The Atlanta Journal in the 1930s, perhaps later. If his "Pam" was syndicated, it surprises me because I thought he just did it as a sideline. My brother, a commercial artist, considered Brewerton a poor craftsman, said he couldn't draw hands, etc. Fascinating to see that he could do something better, like the "Dubbville Foursome." I'll pass this on to my brother, who will be most interested. Yup, "Pam" actually was syndicated. And I concur with your brother that it was pretty bad. In fact, everything I've seen by Brewerton that breaks out of his pleasant bigfoot cartooning style is wince-worthy to say the least. I always thought it funny that the Sunday topper strip to "Pam", called "Donald Dare The Demon Reporter", which was done in his 'cartoony' style, was so much better than the main strip. When you look at the two strips next to each other it's hard to believe they're by the same guy. Brewerton was not only a cartoonist but a photographer as well. In some research I'm doing on a documentary, he was part of the 1909 Good Roads Tour, sponsored by the Atlanta Journal and New York Herald. He took some pretty remarkable photos on the tour as well as created some pretty insightful cartoons of the motorists. If someone has any idea as to where any archives of his photography my exist, I would be greatly interested. Some time ago I read the comic strips from the Buffalo Evening News from 1928 to 1945, including Ella Cinders, Bound to Win(later Ben Webster's Career) and Pam, among many others. Pam was carried from its inception to early 1941 in the Buffalo paper. Did the strip actually continue in papers until 1943? I found the drawing sketchy and memorable as a child when my aunt read this strip and others to me. I had a sentimental feeling toward these strips and enjoyed hearing them as a child and so reading them on microfilm was a labor of love. As one brought up on serials of that day I enjoyed it. The initial strip finds Pam coming to the big city to work! Later Pam and her friend David were involved in many dramatic situations and I grew to enjoy the drawings! I would love to see this strip reprinted, along with many others. I personally can not be critical of it! The strip was stylized and interesting to read. Compared to the poor artistry of so many contemporary strips, it is not without merit. I would love to see the Sunday edition of Pam since the News carried only the daily strip. Could someone name a paper where the Sunday strip appeared? Not 100% sure, but I think the Sunday ran in the Chicago Times. I have quite a few Sunday tearsheets but not from complete sections, so don't know the various papers. Did a little more digging ... one paper that did run the Pam Sunday for sure was the Oregon Journal. News of Yore - Matrimonial Edition! F. W. Hopkins, a Chicago cartoonist, and Miss Eleanor Matthews of Ludington Michigan, were secretly married in Chicago last week. Hopkins was the creator of the daily strip Scoop The Cub Reporter. Six years ago three bachelors came to New York, and in their studio on Washington Heights swore that eternal celibacy would be their state in life, and that designing females would have no place in their scheme of things; and almost six years passed without any deviation from the letter or spirit of the oath. When the summer of 1916 rolled around, however, H.T. Webster, a cartoonist with the New York Globe, and one of the trio, met Miss Ethel Worts, a Toledo girl, and after knowing her for two weeks, promised to love, honor and obey till death did them part. The event was being celebrated at a dinner last Sunday evening at which O. O. McIntyre, a New York correspondent, was host. About the table were Mr. and Mrs. McIntyre, the bride and groom, Ray Rohn, an artist with Judge; R. M. Brinkerhoff, an Evening Mail cartoonist, and Miss Edna Patterson. Then Webster rejoiced, for the company was told that Mr. Brinkerhoff, the second of the three eternal bachelors, had deserted the standard, and was betrothed to Miss Patterson. The wedding will take place in the fall, and meanwhile all eyes are turned to Mr. Rohn, whose next move is anxiously awaited along Park Row. R. M. Brinkerhoff, cartoonist of the New York Evening Mail, and Miss Edna Patterson were married on March 3 in New York and immediately sailed for Havana, Cuba, to spend their honeymoon. When Mr. Brinkerhoff came to New York six years ago from the Middle West, he lived with H. T. Webster, artist of the New York Globe, and Ray Rohn, also a knight of the brush, and the trio formed a compact to remain bachelors. The first to break the circle was Mr. Webster, who married Miss Ethel Wortz a few months ago. Mr. Rohn, so far as is known, intends to remain in single harness, as he threw rice and old shoes at the honeymooners when they were leaving the pier. John Knott, a St. Louis newspaper artist, and his former wife, who divorced him last July, took out a marriage license in New York on February 5. Knott was the creator of the panel cartoon Penny Ante, also known as Eddie's Friends. Sidney Joseph Greene, cartoonist on the New York Evening Telegram, and Mrs. Louise Lauder-Milch were married on July 6 in New York. 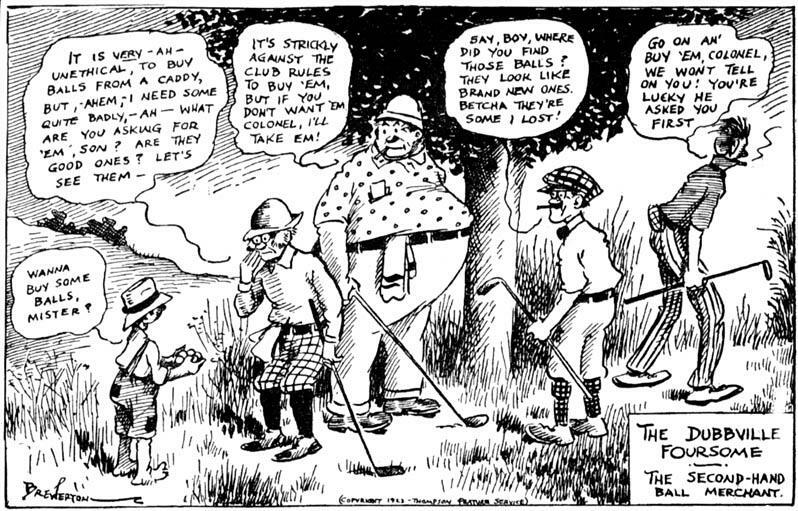 Sid Greene was sports cartoonist on the Telegram, and did a few very short-lived strips, including This Is The Life and Evening Telegram Movies. Will Morgan DeBeck, a cartoonist on the Pittsburgh Gazette-Times, and Miss Marion Louise Shields of Youngstown Ohio, have announced their engagement. Russell Henderson, cartoonist on the Chicago Record Herald, has been married to Miss Gladys Scott. Henderson did an excellent daily strip for the Record-Herald titled The Adventures of Ziggy and Zim. Notice in this introductory strip that he refers to fellow Record-Herald cartoonists Ed Mack and French (whose first name I don't know). Robin Grove, a cartoonist on the St. Louis Times, and Miss Cornelia Harrison have announced their engagement. Assuming this is the cartoonist who signed his work Roy rather than Robin, he was a journeyman cartoonist who did a number of strips for the NEA syndicate from 1918-1925. His longer running features were Bugs and The Boys In The Other Car. Any info available on Frank "Hop" Hopkins of Scoop the Cub Reporter and Snuggle Pups? What in particular are you looking for; I do have info on the features, not much on Hopkins himself. Hello, I am two years late. Frank Hopkins was my grandfather. I have some of his other art in my house. I would like to find more cartoon work. He also did wood carvings of cowboys, bronze figures of golfers, engravings for golf trophies, and various whimsical items. I have a great print of two horsey women that he did. We'd be very much interesting in knowing more about Hopkins -- he had a very interesting career working for the oddball International Syndicate. Any info you have on his work life would be especially appreciated! Early Syndicate a Shabby Business? The syndicate, though unnamed here, is undoubtedly the International Syndicate. At the turn of the century this tiny syndicate did exactly what Mencken describes - they syndicated little panel cartoons with the so-called 'he-and-she jokes'. They provided these to newspapers in addition to a budget of general art cuts that could be used for sprucing up ads and fillers. Later on the International Syndicate would be one of the first to offer true daily comics, the first of which was Scoop The Cub Reporter. * found a run of the advertising-underwritten strip The Story Of Our Country in 1935. The closed-end strip ran 78 episodes. This is the only strip I've found from the Globe Feature Syndicate. * found a start date for Are You Superstitious, a panel cartoon that was locally produced special for the Washington Post. * also a start date on the weekly panel Now I Know, a Believe It Or Not type that ran only on Sundays in the kids section. I never found a syndicate stamp, but since it is by Robert Pilgrim I'm guessing that it was produced by Bell Syndicate. * found a start date for the second run of Joe And Asbestos. The original run was in 1923-26, then it came back in 1932. It is a racing tip strip following in the tradition of A. Piker Clerk and A. Mutt. The numbers printed in the first panel are 'lucky numbers' for the numbers games that were populaar in those days. * found Oddly Enough, a local interest strip produced, obviously, for newspapers in and around Washington. Weird part is that a feature of the same name was produced for Philadelphia papers in 1932-34. But that one was a weekly panel (this one is a daily) and by a different cartoonist. Not sure if there is any relation or if it is just a coincidence.